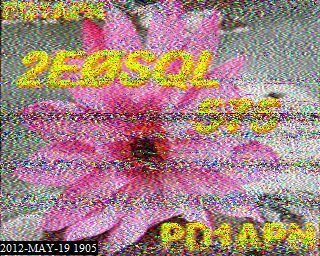 During the last couple of days on HamTests IRC chat there’s been a few chats about SSTV, personally I’d only RX’d images this evening I decided to give it ago and managed to work PD1APN on 20m! 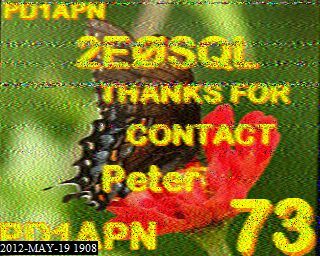 I used to run SSTV on 2m FM many years ago, a group of us were nicely active for a while but I got fed up with it quite quickly. The slowness of the mode bores me silly. I appreciate the irony of saying that because I’m quite happy to run JT65 where a simple exchange of report and locator takes 5-7 minutes but I just can’t do SSTV any more. I tried on 20m last year but I really couldn’t get excited about it. I’m pleased it’s a mode I’ve used a tried but it’s not something I can ever see myself doing again.